Winter is almost over! Get ready to think spring with these colorful and nutritious rainbow egg muffins. Spring is coming. I can almost taste it. After the snow and cold I am more than ready to think about new life and color returning. 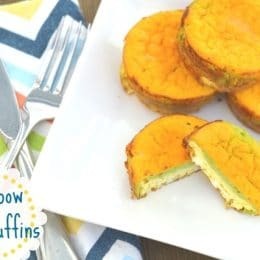 If you look out your window and still see everything covered in white you can at least bring spring back to your breakfast with these colorful rainbow egg muffins. Start the day with a healthy dose of protein, vitamins and vegetables all in one. Add a slice of toast with homemade grape jelly to make it a complete meal. 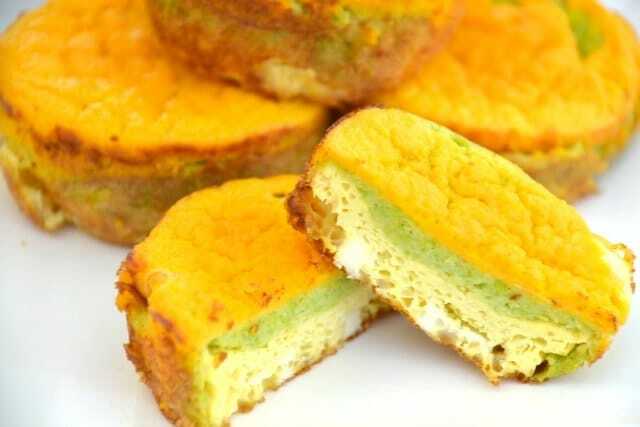 Rainbow egg muffins can be prepared a day or even a few days in advance. Just heat and serve for breakfast. I even like them cold! Pop a couple muffins in your child’s lunch box for a nutritious finger food. 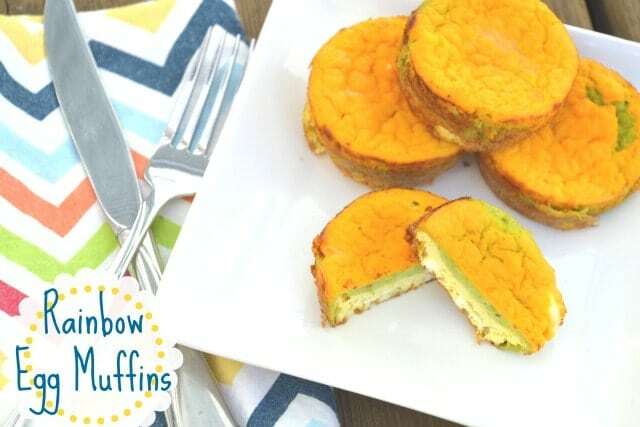 Rainbow egg muffins are even great for toddlers. Cut one into bite size pieces so your toddler can practice picking up food and self feeding. Will kids really eat them? I let my four year old be my taste tester. I put one on his plate and stepped back into the kitchen to grab something. When I got back his muffin was already half gone. The other half went down about ten seconds later. No need to worry about anything artificial. The rainbow colors come from pureed vegetables. Peas create a vibrant green. Squash or pumpkin give you bright orange eggs. Just about any colorful vegetable will work to create fun rainbow stripes that kids will love. Use whatever vegetables you have on hand that your kids like. You can create your own vegetable purees by simply blending cooked vegetables with a bit of milk using a blender or immersion blender. But when you’re busy you don’t always have time for that. Here are some simple tricks to help make rainbow eggs even easier to prepare. Use baby food! The vegetables are already pureed for you. Just add to the eggs and mix. Easy. Use leftover vegetables. Serve peas for dinner one night and save the leftovers to make a puree. Use canned or frozen pumpkin, sweet potato or squash. They are already pureed or soft enough to mash. Use silicon muffin cups to avoid a messy pan with stuck egg. Skip the muffins and make a rainbow egg bake in a square pan. Make a batch of “pea-sto” for pasta one night and reserve a half cup to use in rainbow egg muffins for breakfast the next day. If you’re really busy and can’t wait to pour each layer add them all at once and see what swirl of colors comes out. It will be a fun surprise for the kids! Are you ready to welcome spring back to your kitchen? 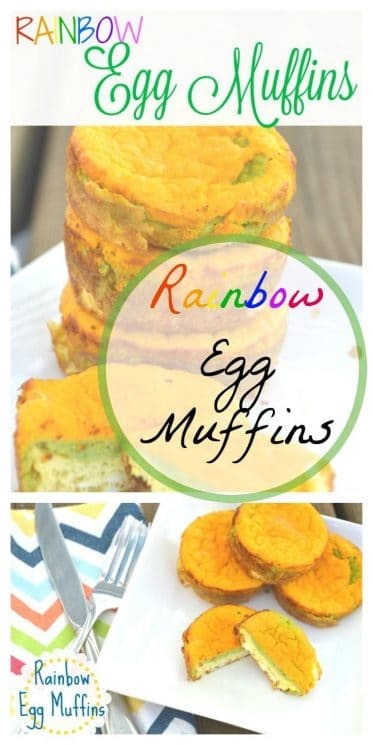 Try adding rainbow egg muffins to your menu. Your kids will love the bright layers. You’ll love that they are eating vegetables for breakfast! Use three measuring cups. Mix the eggs and veggies. Then pour each layer into muffin cups. One batch makes 7-9 muffins. You can easily make a double batch at the start of the week and enjoy a nutritious breakfast all week long. Mary is a Christian, a wife and a mother of three young children. She has a passion for real food and will help you navigate the world of food allergies and feeding challenges such as picky eating, oral SPD and tongue ties. She blogs about meal planning, feeding tips and healthy food at Just Take A Bite. Heat the oven to 350 degrees F. Line a muffin pan with silicon muffin cups or grease the pan well. Mix the ingredients of each layer in measuring cups (for easy pouring). For the green layer, cook or thaw peas and puree with milk. Fill muffin cups about 1/4 full with the yellow layer. Bake for 10 minutes. Pour on the green layer. Bake for 10 minutes. Pour on the orange layer. Bake for 25 minutes. Add extra herbs and spices for extra flavor. 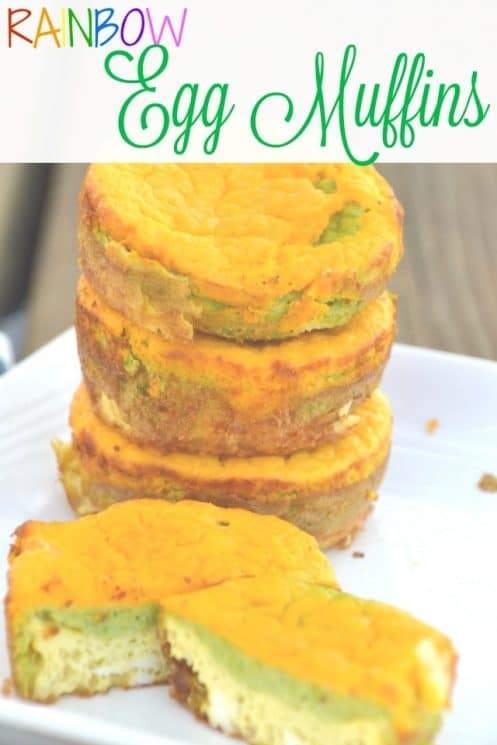 Add a Tablespoon of grated cheese between each layer for cheesy egg muffins. Replace the squash with pureed pumpkin, carrots or sweet potatoes. Replace the peas with pureed spinach, broccoli or avocado. You can add pureed cauliflower to the first layer. These are perfect my kids for breakfast. I made them tonight (for the rest of the week) and let them try one and they ate it! I used spinach instead of the peas and added cheddar cheese. They were a hit. Thanks so much for the recipe. I’m so glad you liked them, Abby! My kids love them too. So happy to find this receipe, my 6 year old daughter is so fussy its really a tough job to make her eat anything. Thanks for the receipe. Can i try these using microwave?? Kindly let me know the temperatures for the same. Amy, I’m sure the microwave would work. However I can’t really advise you on it because I haven’t used a microwave in about 5 years. An oven or toaster oven helps keep the nutrients in tact in your food. I don’t think eggs take long to cook in a microwave…maybe a few minutes? Give it a try and see. Have you tried freezing and reheating these? Just curious if they freeze well. I haven’t tried freezing them but I bet they would freeze just fine!